The Prime Minister, Dr Motsoahae Thomas Thabane led the sod turning of Mpiti to Sehlabathebe road construction held at Tsoelikana Council in Ha Matlali. Addressing the public at the event, Dr Thabane said the road is going to bring positive change to all communities around the area, adding that it is also going to be a key opener to infrastructural developments such as hotels and guests houses that will assist to accommodate tourists during their visit to Sehlabathebe National Park. He mentioned that the government is certain that Qacha’s Nek will not only grow in business but people will also benefit from road construction because 30 percent of local constructors are to benefit and over 500 people are going to work during this period of 36 months. He said it was shameful to have the National park declared as the world heritage site but tourists struggle to reach the place. He pleaded with the community to work together with the contractors to make the road construction successful, saying it is through this road, that travelling from Sehlabathebe to town will be reduced from 4 hours to at least an hour or two. Meanwhile, the Prime Minister said apart from this project, there are other projects in the pipeline in other districts that are expected to start next year. 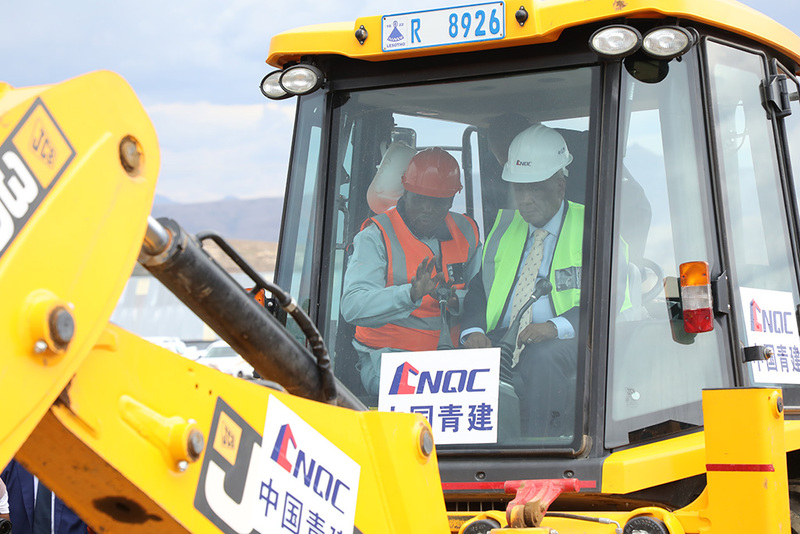 The Charge d’Affires ad Interim of the Embassy of the People’s Republic of China in the Kingdom of Lesotho, Mr. Song Changqing said they are happy to witness the sod turning of Mpiti to Sehlabathebe road. He said the project is funded by the concessional loan to the amount of M1.3 billion provided by the Chinese government and will upgrade the 91 km gravel road to a tar road. Mr. Song said once the road is finished, transportation will be much more convenient for the residents of Qacha’s Nek and the traffic flow will increase by 30-50 percent. He pointed out that the networking of the districts will also be simplified as the road is going to make it easy to travel to nearby districts. Apart from that, Mr. Song stated that the year 2019 marks the 25th anniversary of the resumption of diplomatic relations between the Kingdom of Lesotho and the People’s Republic of China. “In the past 25 years, we have witnessed steady and sound development of our bilateral relations, and increasingly consolidated friendship between the two governments and people,” he stated. The Member of Parliament for Tsoelike Constituency, Dr Pakalitha Mosisili also expressed gratitude over the sod turning event which he said marks the beginning of Ha Mpiti-Sehlabathebe road construction. He said it has been long since the people along that side pleaded with the previous governments for construction of the tar road from Ha Mpiti to Sehlabathebe. He, therefore, thanked the government for making this dream come true, saying this will improve the lives of the people in this area as through the road, developments will take place. In an interview with some of the villagers, Mrs. Mathabiso Moronti said they are speechless because they had cried over this road but finally it is happening. It is expected that the construction of the road before the end of this month.